A striking new cultural space is taking shape in New York’s Hudson Valley. Entheon will offer a three-story, 12,000 square foot exhibition of the finest original artwork of the Visionary Art movement, where precious paintings, drawings, sculpture and moving image resonate with the highest states of consciousness. A chapel room with cathedral-esque latticework ceilings and archangels will display the Grey’s acclaimed Sacred Mirrors series. Entheon means “a place to discover the Creator within.” At CoSM, Entheon will be a sanctuary of Visionary Art, honoring and preserving works that point to our common transcendental source. Three-stories of inspiring art will be installed when construction and renovation is complete, a build that began Autumn 2014. Framing and utilities are complete, walls are finished and being painted. The “intelligence and life” of the building is being turned on now and finishing work is underway. 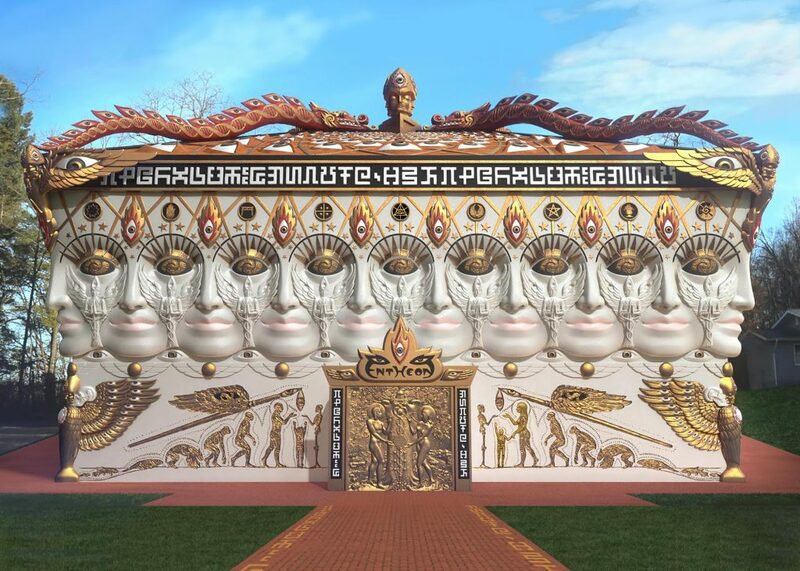 The cast concrete sculptural exterior countenance of Entheon, designed by Alex Grey and modeled by Academy Award winning animator, Ryan Tottle, will be created and installed following the opening of the exhibition, as funding allows. Of This Enduring Temple for Visionary Art! dedication, or memorial to a loved one. and meditation spaces surrounding Entheon. The Entheon Portal will feature doors of bronze sculptural relief entitled, Creating a Better World, by Alex Grey. Depicting Adam & Eve returning to the Garden, the artists paint a new world and harvest the Tree of Wisdom. The Entheon Museum Shop will offer affordable originals, limited editions, books and posters of the genre, an attractive and eclectic selection of artistic gifts and fine altar objects. The Psychedelic Reliquary will host treasured artifacts and ephemera, including the spectacles of Dr. Albert Hofmann and the ashes of Timothy Leary. An altar honoring Visionary artist, William Blake will include Blake’s bust and rare graphic works by this essential Visionary artist and thinker, a featured highlight in the history of visionary art. A shrine inside the Reliquary Room will be dedicated to Alex’s artistic collaboration with Grammy Award winning band, Tool. Enter the Chaos, Order & Secret Writing world of Allyson Grey. Through devotionally labor intensive drawings and paintings, her mystic abstractions point to the fabric of spectral light at the foundations of consciousness. Alex Grey's original paintings Kissing, Copulating, Pregnancy, Birth, Nursing and other works comprise the Progress of the Soul series, on view in a narratively unfolding story around the room. Additional galleries on the second floor will exhibit performance relics and rarely seen early footage of the Grey’s provocative performance art rituals that led to the creation of CoSM and Entheon. One of Alex's most beloved monumental paintings, Gaia, a twelve by eight foot masterwork, will be on view. Painted in 1989, this visually prophetic work articulates the plight of our environment while also revealing two airplanes headed toward the Twin Towers. The third floor of Entheon will display Alex Grey's most transcendental and beloved paintings. Theologue, an ethereal landscape, fifteen-foot wide, provides the ground of being for a translucent meditating figure. Net of Being, featured on the album of Grammy award winning band, TOOL, Cosmic Christ, World Soul sculpture and Allyson Grey most reproduced work, Jewel Net of Indra, will grace the walls of the Great Hall, a meeting place for CoSM’s greatest community gatherings. Enter the brick archway into the Chapel of Sacred Mirrors and reflect on twenty-one stages of the self, a transformation from the physical body into pure infinite love energy. Discover the creator within. 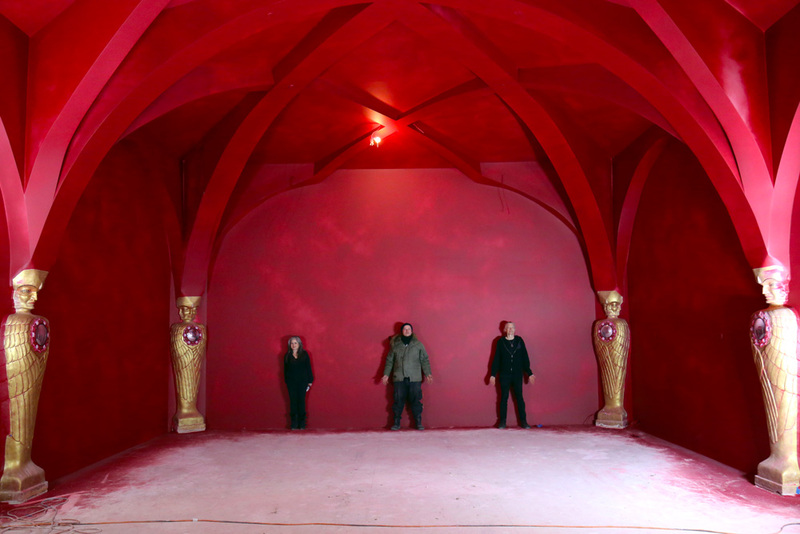 Alex, Allyson and Building & Property Manager, Brian James, standing in the Sacred Mirrors room, December 2017. The inspiring 3-dimensional countenance surrounding Entheon will be sculpted in cast concrete. Giant molds will be created for the sculptural elements. The Steeplehead, the bronze doors, and the Soulbird guardians, the first sculptures to be funded for the exterior, are in creation and may be installed for the exhibition's opening. Emerging from the Angels of the Four Directions, DNA Dragons of Consciousness Evolution, ascend to the Steeple Head, the One. The Steeplehead, cast in aluminum and hand painted, was the first Entheon sculpture to be funded, cast in Thailand, blessed by Dr. Bronner Camp at Burning Man, is ready to be installed when a Certificate of Occupancy is obtained from the Town of Wappinger. The Steeplehead of Entheon suggests the people of four directions coming together in visionary oneness, a pinnacle of Sacred Unity where humanity meets divinity. Banding the roof line, Secret Writing represents the language of creative expression. Allyson Grey's Secret Writing, comprised of twenty unpronounceable letters, are an original alphabet corresponding to the nameless presence existent in all sacred writing, the spirit embedded in communication that cannot be reduced to concepts. Thanks to the outstanding 2013 Build Entheon Kickstarter Campaign, the support of 1,510 backers shot the project forward to fund architectural and engineering plans. With those funds, the bank came through with a construction loan and the build was initiated. Alex and CoSM Head Builder, Brian James with the engineering and architectural team of Murdoch/Salon, NYC, planning the transformation of an 1882 Carriage House into a public exhibition of Visionary Art. The 2016 Entheon Kickstarter campaign funded the power station to acclimatize and bring light to galleries, water to seven bathrooms, smart access and security throughout Entheon’s 12,000 square foot, three-story structure. Doubling the support over the previous campaign, the creative visionary community clearly answered the call and the station is now being empowered. Interior work and equipment is still required before we can Open Entheon. Consider making a contribution to fund a gallery ($75K-$250K). Naming opportunities are available. Exterior work is also required before we can Open Entheon. Widen & Pave a Quarter-Mile Driveway. Consider making a contribution to fund the lamp posts that will light the way for many pilgrims. Naming opportunities are available. To all who have helped in so many ways make this historic sacred work of co-creation an ongoing success, a community thanks you and we thank you with all of our hearts. The building of a temple! UPDATE VIDEO WILL GO HERE. All of the stone dust for bedding the electric came from a quarry 25 miles away. Here we can see the soffit vent detail on Entheon's exterior. This 4-inch channel around the roofs eves will allow convection to occur under the roof. The entry way slab being poured over the buildings radiant tubing matrix. The first floor of Entheon will be self-heating. A few pieces away from having the trusses completely installed. We're looking at being water tight by thanksgiving. Wanting to honor those that came before us and the antiquity of the old structure, Alex and Allyson asked that we preserve and restore several portions of the old building so that they could be visible in the new gallery. The first trusses for Entheon's roof assembly arrived on Thursday as the brick work in the Sacred Mirrors room was finished. The CMU portion of Entheon will be passed the 3rd floor by weeks end. In preparation I prepared the lumber and steel order for the 3rd floor this afternoon. Being that the roof is still in fabrication, we'll be able to build the floor sections on the ground and crane them into place. Considering the economy of motion we had a concrete pump truck come in and pump concrete into the top wall forms. The bracing worked and and the forms held. The walls have completely stabilized. The rebar matrix running through the cap is extensive. Each vertical piece is drilled 1.5' into the brick wall and then tide to the horizontal members. The horizontal pieces are bent around the corners and connected to one another around the entire top wall of what will be the Sacred Mirrors room. The walls were very unstable especially above door ways. Being that the roof load is to increase and that we'll be increasing the wall height a top of the brick , we had to form a concrete cap atop of the brick to unify it. Extensive bracing had to be put in to lock the form to the walls beneath it. Being that we removed the trusses and roof framing from the second story brick walls, there was no longer any lateral bracing above the second story floor line. After reviewing the plans for Entheon to make sure everything is in order and getting all my sub contractors insurance certificates, I am ready to submit the plans for a building permit. It will take many lengthy interviews and fb entries to describe what this means to all of us at COSM. A special thanks to all of you who have or still do contribute to our cosmic cause. Say a prayer for us tonight. Tomorrow may be historic. I'd also like to thank the town of Wappingers building department for being there for us through three other buildings and for being so supportive, kind, personal and present over the last six years. Thank you to my family and friends for allowing me to take all the time away needed to achieve this goal. Love and light- god bless. The approach to Entheon will be magnificent. Here we see the back of the existing building, awaiting it's make over. 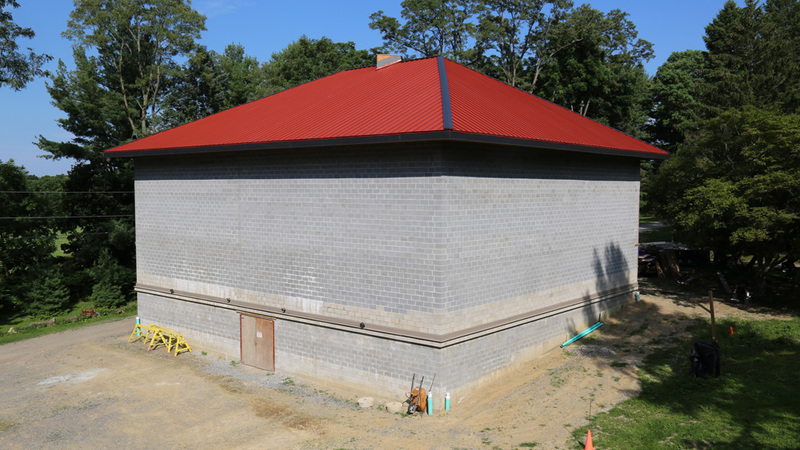 A new storage barn will be made in a similar style to the old, but with a larger foot print. Here you can see the wood as it's being stripped. In view of the site work needed to get the Entheon, we had to take down the old barn. This beloved structure served us as a tool and storage shed. We recycled the materials to use in other projects. A series of ribbed vaults will connect the crowns of the Seraphim. The final sculptural elements are to be determined.Modeling allows us to account for all the negative space. The new space will house Alex and Allyson's works. To get a better understanding on the final details we made a model of the Sacred mirrors room. The models is scaled to the miniature frames. The sacred mirrors stand 5' wide by 10.5 high. The small garage stood to the right of the carriage house. Between the two openings and near the roof line there's an erection stone that says erected in 1868. Inside the door on the right you can see a small model of the soon to be exhibition hall. We all gathered to honor our experiences with the building. For it's last years it served as a garage and housing place for equipment. We saved all the decent brick we could for use on the brick elements that we're adding. Demolition of a small brick garage next to the new exhibition hall. The building was too unstable to save and corrupted the facade of the design. After three years we're working on the project we came here to do. Total Cost to Install: $31,036.18. Water Main to Road/Sprinkler: $70,000.